The Faith of the Pure Ray: Where are we in the global dance? Where are we in the global dance? 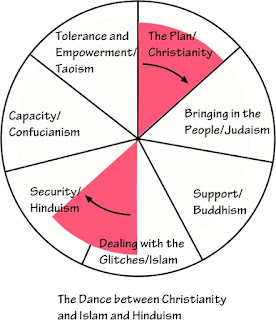 The planning circle is divided into seven segments, and opposing segments have much in common. The plan segment and the glitches segments both deal with problems. Because the segments don't line up, and there is a progression around the circle as you work to create a project, half way through the segment, on the opposing side, you start to address new ideas. Each segment is divided into three steps, based on this progression. The plan for the international government has been opened to debate, and people in 81 nations support the idea, especially those who have had no voice in matters of grave concern. This is their chance to function on a higher level. On the opposing side, we address the issue of ending terrorism and also making it happen, and then as the idea continues to progress in its creation, we must address the issues of security. The first step for the plan for the international government is the Exit Strategy for Iraq, as people stood in protest, but the opposing concept is to realize mankind has three choices, and that the existing structure doesn't have the capacity to end or prevent wars, and that the other apparent option is that it is in no one's best interest for one individual to become supreme leader of the planet. We are looking at the plan concept and which plan will replace the existing structure. As the idea progresses through the plan segment, we must address the resistance to the plan by those who rely on the existing structure for the livelihood and support.